The bad news – Marketers have become less efficient at converting buyers. The global abandonment rate climbed to more than 80% in 2018. How much revenue are you leaving behind? The bottom line – Digital marketers must find ways to do more for less. You’ve got your advertising and marketing strategies all figured out. Everything is ready to go – your display campaigns are lined up; your website promotions, your paid social ads and your SEM campaign. You have selected vendors who are ready to support aspects of your strategy. If your strategy looks like this one, there’s a fundamental flaw you’ve overlooked. With the significant amount of overlap, multiple vendors will claim credit for the same conversions. You end up paying more than once for each conversion. In some cases, we’ve seen as much as 18% attribution overlap. That’s not very efficient. 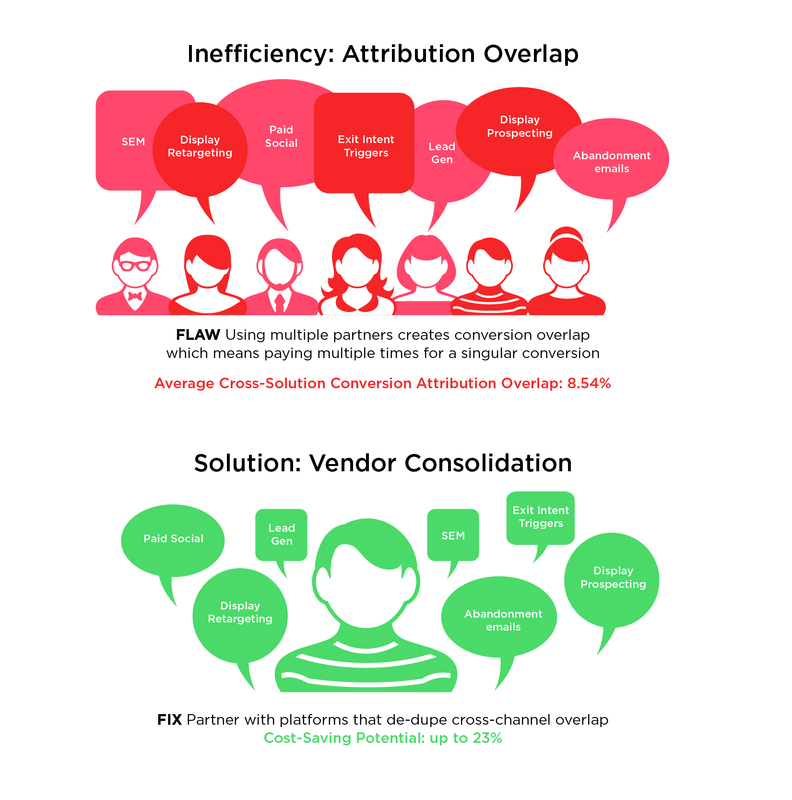 To minimize attribution overlap, find partners or vendors that can manage multiple parts of your strategy. It will cost you less to achieve the same results. It’s the key to doing more for less. In addition to multiple vendors and attribution overlap, “teams stretched too thin” is the next big factor impacting efficiency. 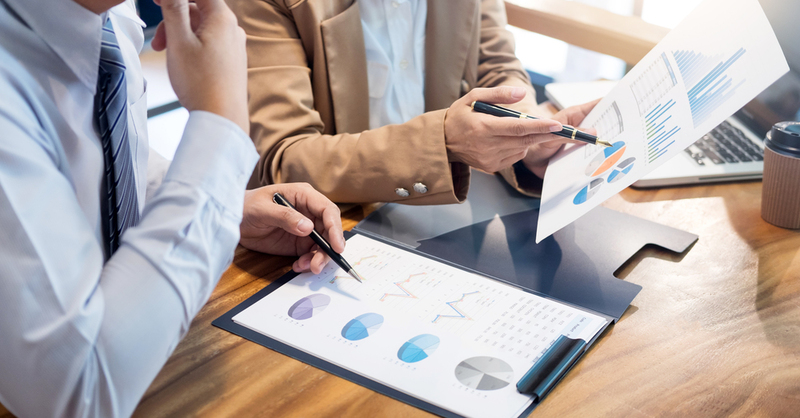 How do you reduce vendors, do more testing, and incorporate new tactics and tools without putting a strain on your resources or incur additional costs? Of course, you can always hire more resources or pay for 3rd party services. In fact, a staggering 82% of companies are still paying for outside resources. But that won’t increase your ROI or do more for less. It’s probably best to keep your internal resources focused on projects they can devote their full attention to and deliver the highest quality output. You can also keep your checkbook closed. The answer to single attribution and increased efficiency is choosing a partner that can achieve more of what your digital strategy needs to deliver at no additional cost to you. Do they provide fully managed services for the entire campaign? Do they provide the tools to support User Acquisition and Customer Conversions? Can they create custom strategies tailored to your business goals that go beyond the scope of standard paid media campaigns? Do they offer a pay-per-performance model to remove initial risk factors and up-front costs? How does the vendor use analytics to identify user abandonment and begin retargeting to recover lost sales? Can the vendor act as an extension of your internal team? With the right partner, your costs will not rise but your ROI will. You will enable greater efficiency and success for your internal teams. As a partner that can provide a full spectrum of digital solutions, and a complete list of complimentary services, we at Cybba have estimated a cost savings of about 6% for our partners. Count us in as an extension of your own team! Lisa is Cybba’s Vice President, Travel and Enterprise Sales. For the past five years, she has helped companies in the Travel & Hospitality industry design custom digital marketing and advertising strategies to drive increased performance and conversions.